Dr. Aurelio Agcaoili, from the University of Hawai’i, read excerpts from his books, Asesino Kadagiti Balikas (Assassin of Words), Zona Zero (Zone Zero) and Signos (Sign). “I looked back into how, for example, power, authority, and leaders deceive us by the kind of word that they utter or express,” Agcaoili said. According to Agcaoili, the said book is a review of the capacity of human language to give us hope, and at the same time, its capacity to lie to us, which means, language is the problem. “Meaning to say, language is the problem we have to acknowledge, but then, language is also a means by which we can solve problems. So, there is a kind of an irony, kind of a paradox at the same time,” Agcaoili said. Agcaoili concluded that we, people are all assassins of word because we utilize language depending on our intention. Furthermore, Agcaoili also did tell the idea behind his other book, the Zona Zero/Zone Zero, which is about life. Moreover, Agcaoili said that his book, Signos/Sign, is a different story because this came from the idea that he has a protégé, who was about to replace him in his work at the university as the head of the program. Agcaoili narrated a story about his protégé who died of cancer the day after taking over his post in the university, and how he came to think of the signos. “Before he died, I asked him to take over my post as head, and he said yes. He was able to, somehow, take the post only for a day, the second day, he died. But before he died, I did know that he was already at the ICU, and then his days were numbered [but those close to him were in denial, including him],” Agcaoili said. Before his protégé died, Agcaoili came to the Philippines to start the Ilokano program at the Mariano Marcos State University. “When I was coming home, I got United [Airlines]. Halfway through our flight from Hongkong to San Francisco, something went wrong to the airplane. And so, the pilot had the courage to, somehow, decide to go back to Hongkong, otherwise, we will all burn and die,” Agcaoili narrated. “I didn’t know that he was dying. But I was trying to think that, maybe he saved me from my death—ay inagaw nak diyay signos ko,” Agcaoili said. According to Agcaoili, after all, it is all about life; how we deal with the finitude of life. “I write personal things, but these personal things do not end up as personal, they really take… what is happening to our society,” Agcaoili concluded. 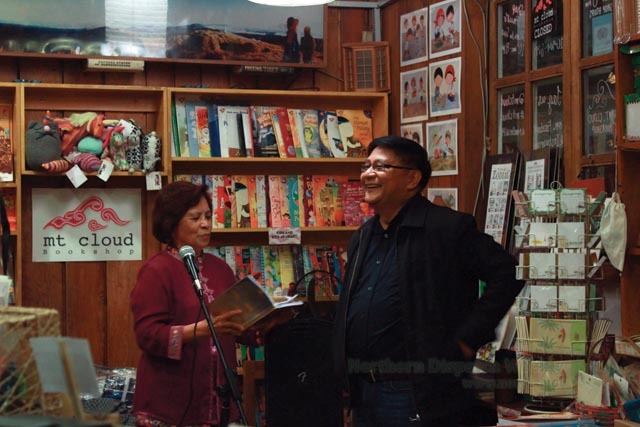 Aside from Dr. Agcaoili, Dr. Sonja Chan, a professorial lecturer at the University of the Philippines Baguio, also read excerpts from her book “Listen Dear Heart” (Umarasaas ‘Tay Rikna). Chan said that her inspiration in writing her book was her love for language. “With all the experiences that I had up to this time of my life, I felt that I had to express myself somehow and share these experiences and I found poetry to be my media,” Chan added. Furthermore, Chan said that in terms of convenience in expressing ideas, Ilokano is the most convenient language to use because it is her native language since she comes from the North. “Having been distanced from the North because I’ve been all around, it was like going home to pick up my language and had poetry as my vehicle for expression,” Chan added.